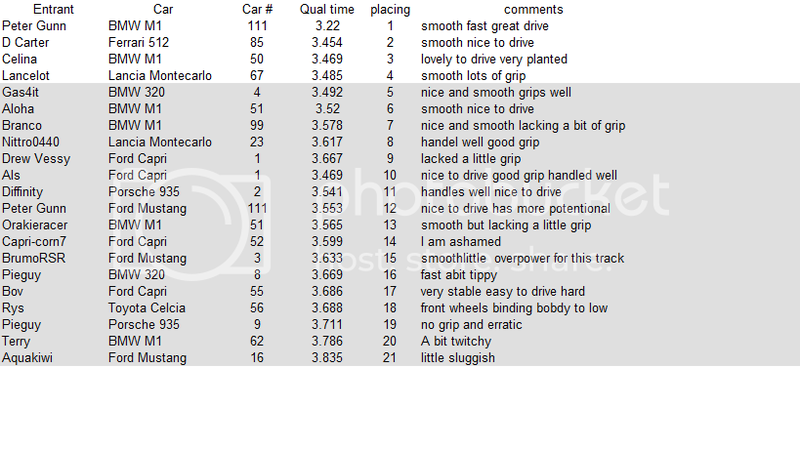 Looks like cars 23 and #1 are faster than the 3.617 and 3.667 respectively in qualifying. Thanks for the qualifying run David and Great job P Gunn gaining the p1 spot in the quali. Good luck to all the builders, may you place higher than you might expect. Edited by Brumos RSR, 23 January 2019 - 01:08 PM. Thanks Dave - I had hoped you'd drive but it was fun to run all the cars again. Track hasn't had much use of late so I think on race night with our "guns" driving & grip improving we should see times tumble. But you can be down a lap and a half quite quickly before your car is marshaled. It will be a fun night. Hoping to run the round this Thursday night if we can get the numbers. I'll keep you posted. Number 99 probably runs better on 3 wheels. Could be Delboy's car in "only fools and horses"
So I hope that the drivers do not see this as a ‘race’ but rather like a proxy, where the goal is to aim for as many laps as possible. It should be run as a ‘time trial’ running alongside other cars rather than a full on club race. Less de-slots that way. So I hope that the drivers do not see this as a 'race' but rather like a proxy, where the goal is to aim for as many laps as possible. It should be run as a 'time trial' running alongside other cars rather than a full on club race. Less de-slots that way. Yes we've run many proxies and are always very respectful of the cars and the process. I was surprised at how well most of the cars coped with Pat's track. Being sort of flowing, but small and tight, and having very fluid elevation changes through the curves, the tyre load changes momentarily from 4 wheels to 2 or 3 a number of times each lap. An unstable car is hard to drive here, but we had very low numbers of deslots. There were heats where we were each pushing our lane/car yet 3 cars circulated the entire heat without a deslot, as if on a piece of string to one another. - Dave - Brumos Mustang and whoever ownsed that Rodenstock 320 should be sent an email regretting their loss in the return post. Thanks Slots. I very much regard your, and that of the guys who drive alongside you, proxy experience. I know just how hard these (particular) cars can be pushed and driven cleanly. They are a great bunch of models. Good effort on this one. 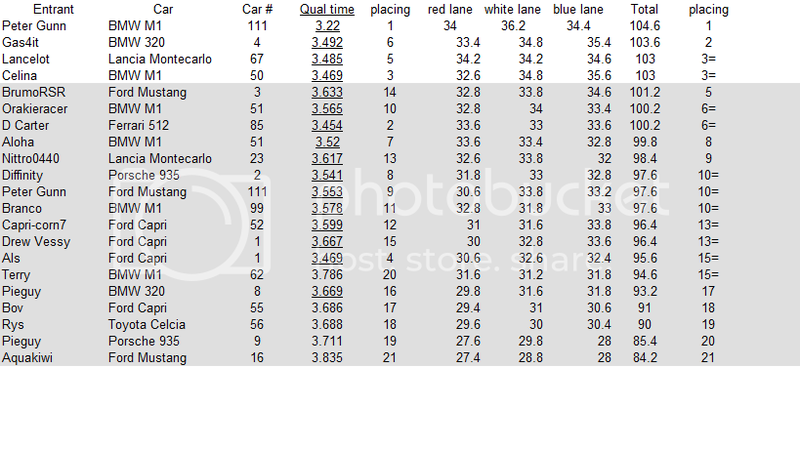 I note that my final placing was effectively 8 (=10) when you take the laps into account. That = qualifying. The best for my car on this track to date IIRC. Thanks. Please don’t forget David, I moved states since I sent the car out - you should have the address in your PMs still. Thanks for running and hosting Dave and HB drivers, Congrats to Peter Gunn Gas4it and Lancelot. You have to admit my car is very consistant. 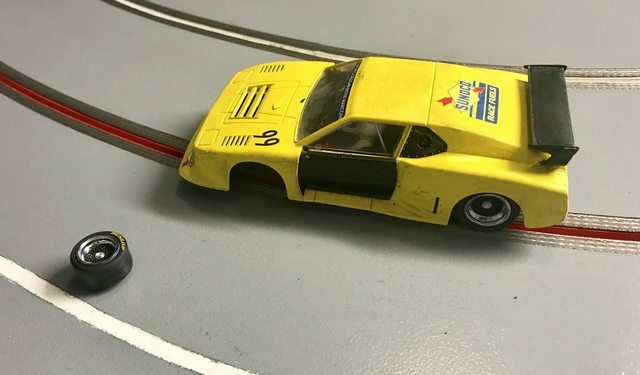 I,m chuffed to win a race at last in NZ, been great sending cars down there first the Can Am , then the Group 5 and lastly the ATCC proxies, will miss not sending anything this year , and i had a nice Camero ready for the ATCC sitting in my car box, oh well have to run with the home cars here. Thanks for all the effort put in by David and the hosts, much appreciated , congrats to Gas and Lancelot for keeping me warm on the podium, and a special well done to all the entrants some really good cars in the Group 5 field.